We have a thing for luxury watches and today we made a list with 10 watches covered in diamonds. Watches coated with lots of diamonds or other precious stones aren’t watches anymore. They are masterpieces. Unique, really expensive, masterpieces. Although they tell you the time like any other regular watch, we buy these fancy watches more and more often. Because let’s face it! We like to show off. One of these watches you can simply call it ‘Jay-Z’s Watch’, because there was only 1 made and Beyonce grabbed it. But not to worry! There are several other wristwatches that can make you feel if not as wealthy as Jay-Z, but close to it. 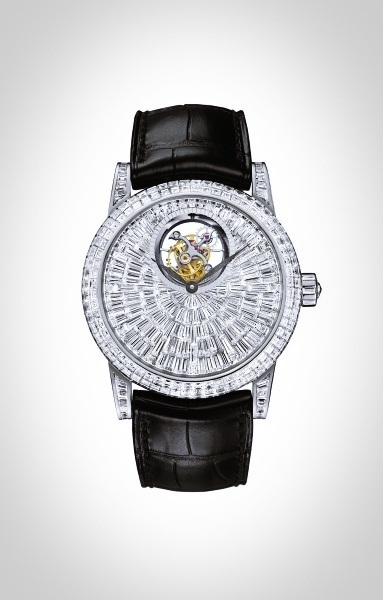 And we begin our top list with Blancpain Tourbillon Diamants, specially created for men. 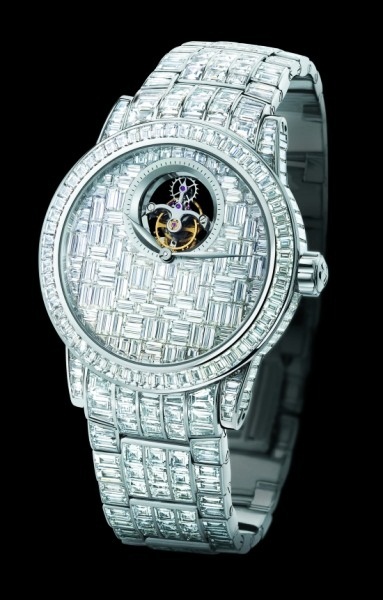 This luxury watch available only on request features a total of 480 diamonds, weighing 58 karats. 43 karats of diamonds set in a 18-karat white gold bracelet make this watch look even more exquisite. Not to mention, it has a 40 mm white gold, water resistant case. Blancpain Tourbillion Diamants has a full-set dial and a classic round shape encrusted with diamonds. And that’s not all! Its dial inside contains a clear sapphire crystal. The price you ask? $1.8 million. Now it’s time for the ladies! With this watch, all eyes will be on you!